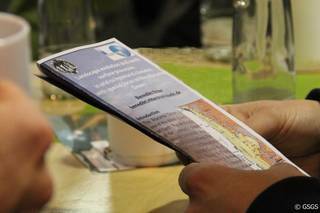 During the 2nd GSGS Research Conference, 23 January 2015, members of the Graduate School of Geosciences had the chance to present their research results to a wide audience of fellow doctoral students in Geosciences, students and department staff. The over 120 attendees listened to three keynote lectures by our international guests and three talks by GSGS members (programme). 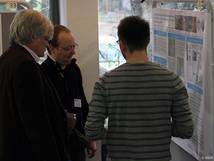 During the poster sessions and coffee breaks, the over 30 posters were discussed enthusiastically in a friendly atmosphere. For impressions follow this link. Prof Peter Dannenberg got the most nominations from the poster presenters and won the "Feedback Award 2015". The prize for the best poster was awarded to Matthias Thienemann, for his poster: “Reconstructing human settlement history on the Balkan Peninsula by lipid biomarkers from Lake Dojran sediments”. The second prize was awarded to Pia Friend for her poster entitled “Closer Look at ancient Solar System Material”. 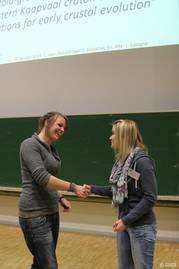 The third prize went to Kathrin Schneider for her poster “Granitoid-greenstone relationships in the eastern Kaapvaal craton and implications for early crustal evolution”. We would like to thank all participants, and especially Eva Holzenhauer and the organizing committee of the 2nd GSGS Research Conference. Please check the poster jury's comments for some suggestions for your next poster.